Hello everyone! My name is Pingping Qu and I am a fifth year Ph. D. candidate of Marine Environmental Biology. I am very honored to be a Sonosky Fellow this summer. My research focuses on the responses of marine phytoplankton, namely, algae, to climate changes. In recent years, my interest is in the group of marine cyanobacteria, who have contributed to the global carbon cycling and food web since 3.5 billion years ago! In this group, “diazotrophs” (namely nitrogen fixers) are very important. They convert atmospheric nitrogen to organic nitrogen, and supply this nitrogen to other life forms including us! In other words, there would not exist plants, animals and humans on the planet today without them. As we know, all ecosystems on this planet are facing huge challenges with climate changes. Among multiple changing variables, warming is an especially significant and influential one. Average surface seawater temperatures are predicted to increase by 3-5°C by the end of this century. 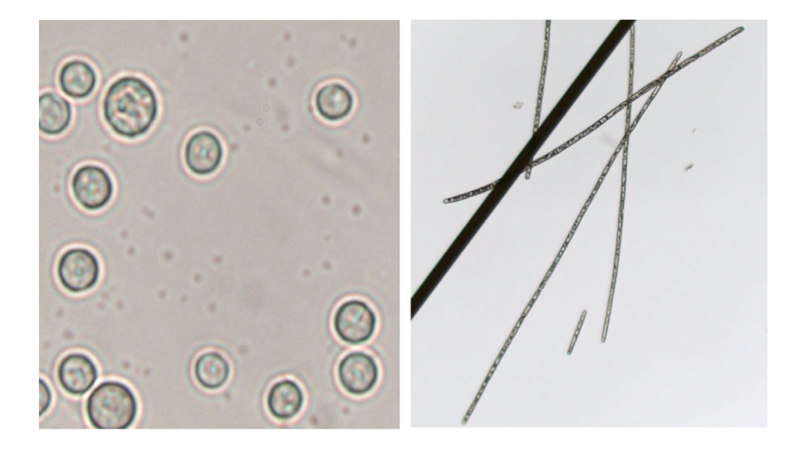 To explore whether nitrogen fixers are able to survive in this future warming, we started a long-term evolution experiment on two of the most important diazotrophs, Trichodesmium and Crocosphaera (Figure 1). To test whether they acclimate (short term adjustments by the individual) or adapt (evolution over multiple generations) to different temperatures, we transferred them to three different temperatures (22°C, 28°C and 32°C) two years ago and maintained them under temperature selection for 2 years. The current optimal temperature is 28°C, while 22°C and 32°C are respectively lower or higher than the best temperature for the two nitrogen fixers. Specifically, 32°C can be viewed as the future warming condition for them. The long-term temperature-selected cultures provide us with excellent opportunities to study both their short-term plasticity and long-term adaptation to temperatures. In this summer and the following fall semester, I am determining the “thermal curves” of Trichodesmium and Crocosphaera selected by three temperatures. Namely, I transfer the selected cultures to a wide temperature range covering the thermal limits of both strains and then observe whether they survive, grow or die at certain temperatures. With the help of our “secret weapon”, thermal block (Figure 2), I can set up a temperature range of 18°C to 36°C, provide the same incubation conditions for my cultures and achieve my goals. In this study, my hypothesis is, 32°C selected cultures take advantage at high temperatures while 22°C selected ones perform better at low temperatures and 28°C selected ones are in the middle. My preliminary data have confirmed at least part of my hypothesis. If this pattern in the hypothesis can last a long time, it indicates the cells may have evolved in the past two years. 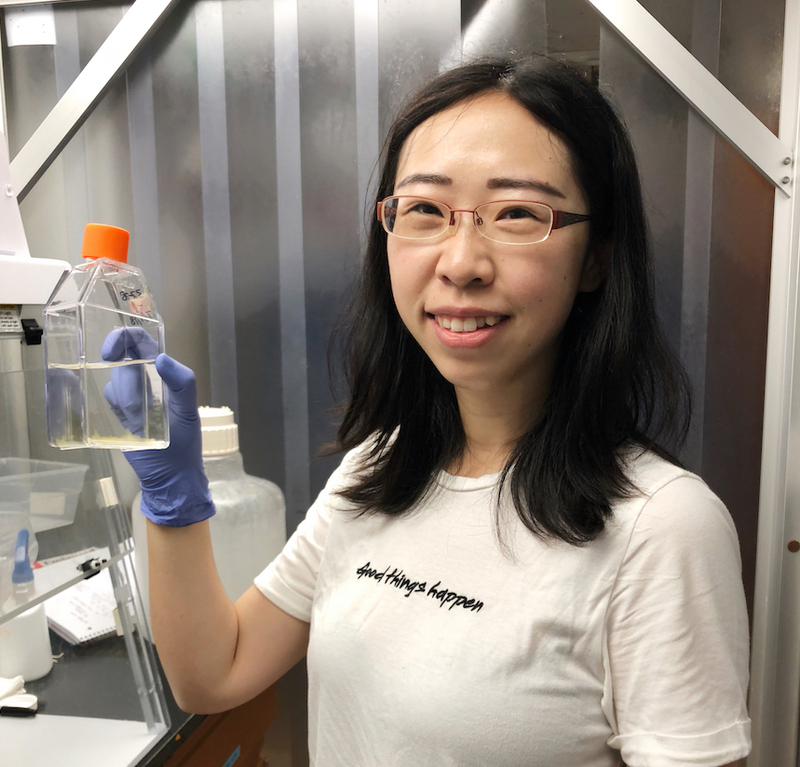 If they can acclimate to different temperatures quickly, it means it is the plasticity, not the genetic difference that help cells survive at suboptimal temperatures. I worked in the lab for this whole summer with cultures, and collected both the physiological and molecular samples. 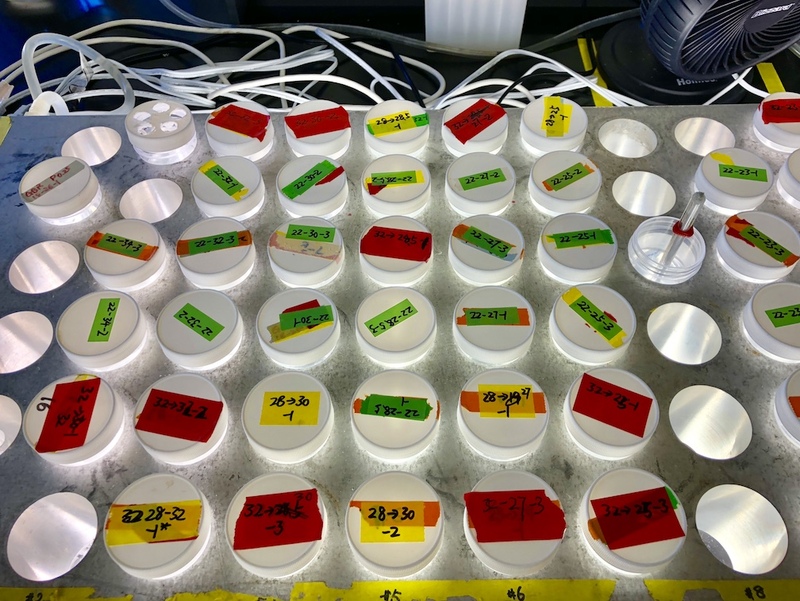 The growth rates, nitrogen and carbon fixation rates, elemental ratios, cell size are measured. DNA and RNA samples are stored for the future analysis. I will fight on in the following semester! (Figure 3). This entry was posted in Graduate, Wrigley Institute on September 10, 2018 by Jessica Dutton.